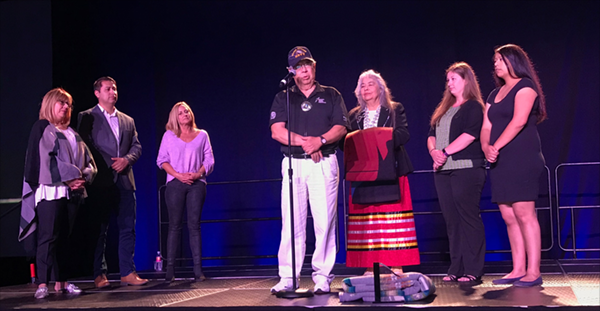 San Diego, CA – April 02, 2019 – The Cultural event highlighted the Tuesday evening of Indian Gaming 2019 last week with the traditional dances that took to the stage at the San Diego Convention Center in San Diego, California. The traditional dances led up the presentation of the 9th Annual Tim Wapato Sovereign Warrior Award to former Chairman of the Coleville Business Council and President of the National Congress of American Indians Mel Tonasket. “One of the greatest leaders of our time. Tim dedicated his time to working hard. He and Gay took me under their wings, as a young leader and showed me the way. He never hesitated to take a strong position with me when needed, but he was always there to stand by me when I needed fatherly support, and most importantly when we needed to fight the fight. He was ready to go to work, prepared to defend Indian Country. Tim Wapato was one of the finest modern day warriors. Tonight, we are honoring Mel Tonasket in his memory.” Chairman Stevens said. Gay Kingman-Wapato, the wife and family members of the late Tim Wapato joined NIGA Chairman Ernie Stevens, Jr., on stage to present the coveted award to Tonasket. She added, “I want to recognize Mel because one of the things he says is the tribes are only as strong as the weakest tribe, so we all connect. His whole life has been devoted to protecting our tribal rights and sovereignty.” She thanked Tonasket for all of the work he has done for Indian country.